The Fender Mustang Bass PJ combines the flexibility of a PJ pickup combination with the unmistakable tone of a short-scale bass. Its smaller Mustang-style body and short scale make this electric bass extremely comfortable, even for players with small hands. This bass's short scale also imbues every note you play with a fat, harmonic richness that's impossible to ignore. Combining classic and modern styling, the Fender Mustang Bass PJ features vintage-style tuners, a 4-bolt neck plate, and 4-saddle bridge â€” all finished in shimmering chrome. The duet of P and J single-coil pickups is one of the most flexible and clear-sounding combinations available. Thanks to its traditional split-single-coil P Bass pickup, you can count on the Mustang Bass PJ to pump out dynamically intense tone. With a Jazz Bass single-coil pickup at the bridge position, the Mustang packs a powerful midrange punch. Bassists here at Sweetwater often combine the tones for a punchy sound with added clarity. Of course, the short scale length of the Fender Mustang Bass PJ's neck makes it easier to navigate the fretboard and is perfect for beginners and players with smaller hands. 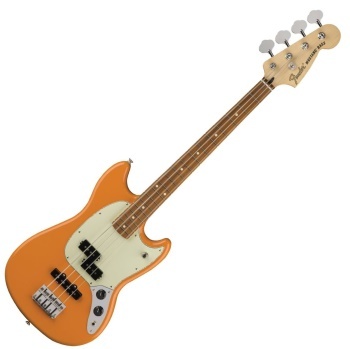 Short-scale basses have a different tonal character because shorter string lengths give you a thicker, mellower tone than a long-scale instrument. Just plug the Mustang into your bass amp, and you'll see what we mean, as notes punch through the mix without becoming overbearing.